A semi-evergreen climber up to many metres tall with irritant, milky white sap. 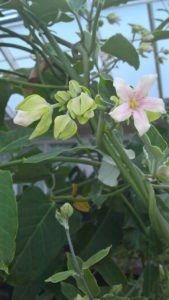 It has pretty, white, fragrant, chalice shaped flowers, tinged with pink. The popular name of this plant, Cruel Plant, refers to the flowers inner parts clamping onto the proboscides (tongues) of nocturnal moths, trapping them until dawn. The moths are released in the morning after the plant has been pollinated by them thoroughly. After pollination the flowers develop into impressive pear shaped fruits up to 10cm in length. These are definitely not for eating though, as the skin has irritant sap and inside is no flesh but hundreds of black seeds attached to silky white hairs. The hairs enable the seeds to be carried on the wind similar to dandelion ‘clocks’. These seeds can be sown on a well-drained compost in a greenhouse or on a windowsill during spring.